While bullying behavior by youth sports coaches is, as MomsTEAM has been pointing out for years, an all-too-common problem, a helpful new article in the journal Pediatrics  explains just why it is so difficult to correct by identifying the four main tactics coaches use to avoid blame for their improper behavior. While acknowledging that the study of bullying has made "considerable strides over the last 2 decades," lead author Nancy L. Swigonski, MD, MPH, of Children's Health Services Research at Indiana University School of Medicine admits that the definition remains vague. Bullying, she says, is "generally defined as a systematic abuse of power, in which a stronger individual exhibits a pattern of intimidating behavior against someone weaker or less powerful." Although most research has addressed peer-to-peer bullying, the fact, as I have been saying for years, is that "nothing in the definition requires [such] a relationship, only 1 individual with perceived power over another." By its very nature, Swigonski says, the "coach-athlete relationship involves an inherent imbalance of power" because the "coach holds authority over his players." "Although plenty of coaches use affirming and encouraging coaching styles, bullying behavior such as demeaning, shaming, and name-calling remains a common aspect of coaching in sports at any level," Swigonski states. As evidence, she points to a 2011 study in the United Kingdom  which found that three-quarters of the 6,000 young adults ages 18 to 22 years interviewed about their experiences in sports earlier in adolescence reported at least 1 incident of emotional harm playing sports, one third of whom identified their coach as the main source of harm, and to a 2005 study  - one I cited in my 2006 book, Home Team Advantage,  and in articles adapted from that book for MomsTEAM.com - finding that 45% of children reported verbal misconduct by coaches, including name-calling and insulting them during play. First, she says, is that the "behavior is a continuum from positive to negative; therefore judging when a coach has 'crossed the line' is somewhat subjective." As sports psychologist K.C. Wilder puts it, it is often difficult to know the difference between critical coach and bully . But the bottom line she says, a position with I wholeheartedly agree, is that "pervasive demeaning, name-calling, and insulting by a teacher/coach is inexcusable," and a pattern of behavior that is not only "outdated" but, simply put, "no longer acceptable." A second difficulty in correcting bullying behavior by coaches are the techniques coaches use that "rationalize and minimize" the negative perceptions of the bullying behavior by others, and it is here that the article offers parents something new. 1. Moral justification: The bully attempts to portray the behavior as socially acceptable, with the coach making statements such as "all coaches lose it once in a while:" or "this is how we have always done things and we win games." Swigonski says that, "by arguing that the behavior is normal, coaches "invoke the logical fallacy that common and good are equivalent. Unfortunately, when a culture of bullying is accepted within a team or in the school, then it may actually seem normal," with the result being that bullying of athletes tends to be "rationalized and ignored." Reading the article, I was reminded of an assistant youth hockey coach who chalked up yelling at a team of nine-year olds in the locker room after a game - as chronicled in a long article I wrote several years back about emotional abuse in youth hockey  - to the fact that, "We are hockey coaches. Do we yell? Yeah, we do, but it's no different than any other sport. We told them they could have played better." Need proof that bullying by coaches is part of the culture of some sports? Look no further than the statement in my youth hockey article by a father of a player, who acknowledged that the coach "yells at the kids when they need to be yelled at, he sits them down when they need to be sat down. I have no problem with any of his tactics," he said. (emphasis supplied). 2. Backhand apology. The second defensive technique Swigonski identifies is what she calls the "backhand apology." A typical bully apology, she says, might sound like "I am really sorry, I got a little carried away, but we really need to work on fundamentals if we are going to win." She points out two problems with such a statement: first, it minimizes the harm by saying "a little"; and second, as with the coach and dad quoted in my article about emotional abuse in youth hockey, it tries to shift the blame to the victim, that it's his/her fault that the coach had to yell because "he could have played better" or that he only yelled at the kids "when they needed to be yelled at." "By implying that if the team had mastered fundamentals he would not have acted in such a manner, says Swigonski, he attempts to deflect responsibility and thereby excuse his behavior." Adding insult to injury, Swigorski notes, the apology actually becomes part of the bullying behavior because it is a "power play that belittles the victim." 3. Using advantageous comparisons. When bullying behavior is compared with a more severe act, Swigonski says, coach is trying to move the goalposts, allowing the coach's behavior to seem more trivial. She cites as an example the girls' basketball coach highlighted in her article who, after being observed by the mother of one of his players screaming at the team that they lacked intelligence and were lazy because they had not executed a play properly, attempted to justify his behavior by pointing out that he never "pushed them around or la[id] a finger on them." Even though physical abuse was not the concern, she says, the coach, by shifting the standard of what might be considered inappropriate, was attempting to downplay the severity of his actual misconduct. 4. Escalation. The last defensive technique Swigorski identifies is escalation, in which the "stakes" are raised, until the person gives up their grievance. Here, she says, the bully essentially "bluffs" the person complaining about his or her behavior into backing down; if an athlete making statements like, "If you don't like the way I do things, you can quit the team." In making such statements, the bully isn't escalating the bullying behavior so much as escalating the situation by presenting the consequences a victim might face if they fight back. As my more than 25 years in youth sports as a parent, coach, journalist, and reform advocate has taught me, this is a tactic that all too many coaches use, not just to intimidate athletes into accepting abuse, but their parents as well, who are either cowed into silence out of fear for the consequences to their child if they don't keep their mouths shut, such as being benched or ostracized, or worse, because they have come to believe in this win-at-all-costs society that their child's emotional health must be sacrificed at the altar of team success. report bullying. Reporting behavior to Child Protective Services may also be warranted, depending on what state law says. Most states have laws describing emotional abuse as injury to the emotional stability of a child as evidenced by an appreciable change in behavior, cognition, or emotional response. While there are no clear guidelines regarding verbal bullying aimed at a team rather than an individual, bullying by a coach of an individual child should be reported immediately to school officials. "Nevertheless," writes Swigonski, "such behavior is unacceptable and coaches should face consequences for verbal misconduct including demeaning, name-calling, and insulting young athletes. Why is it so important to put a stop by bullying by coaches,as well as all forms of emotional abuse, whether it be by a coach, another player, a parent, volunteer, spectator, or official? Because research that shows that bullying, like other forms of emotional abuse, can have dramatic and long-lasting effects on its victims, impairing social and emotional development and causing substantial harm to mental health. "When bullying occurs in an athletic setting," says Swigonski, "those harmful effects are augmented by the stress kids often feel as a result of athetic competition." Children are deeply affected by negative comments from parents, coaches and other adults to whom they look up and respect. One comment can turn a child off to sports forever. Children are much more sensitive than adults to criticism: being yelled at, put down, or embarrassed is much more likely to have negative psychological consequences and to cause the child to feel humiliated, shamed and degraded and to damage her feelings of self-worth and self-esteem. If the abuse becomes chronic, a pattern of negative comments can destroy a child's spirit, motivation and self-esteem. Over time, the young athlete will begin to believe what adults say about him. Abusive comments intended to improve athletic performance are likely to have precisely the opposite effect. Children who experience screaming on a regular basis will react in certain ways to protect or defend themselves. This may be adaptive in the moment to survive the screaming, but ultimately be maladaptive and constrict their ability to be psychologically healthy over time. A more anxious, sensitive child may be intolerant of screaming very early on, and remove himself from the sport (he maybe the lucky one). However, he is also more likely to endure the screaming without telling a parent or responding to the coach directly out of fear of reprisal from the coach. A more sensitive child who stays in this situation may be more affected physiologically with overall heightened arousal levels as discussed above. A more secure child will likely have the same physiological responses but be less vulnerable to them. 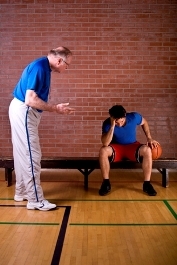 He may find a way to tune out the yelling or the negative commments by the coach, but this may come at a cost of emotional sensitivity. As the child becomes less sensitive to his own fearful feelings, he can become less sensitive to the feeling of others, leading to loss of empathy. He will also become less sensitive to emotions in general, and have a loss of sensitivity to positive emotions as well. He is also likely to resent the coach for putting him in such a psychologically vulnerable position. Brooke de Lench is the Executive Director of MomsTEAM Institute, Founder and Publisher of MomsTEAM.com, and the Producer/Director/Creator of the PBS documentary, The Smartest Team: Making High School Football Safer. 1. Swigonski NL, Enneking BA, Hendrix KS. Bullying Behavior by Athletic Coaches. Pediatrics. 2014;133(2); doi:10.1542/peds.2013-3146. 2. Alexander K, Stafford A, Lewis R. The Experiences of Children Participating in Organised Sport in the UK. Edinburgh, Scotland. The University of Edinburgh/NSPCC Child Protection Research Centre. 2011. 3. Shields DL, Bredemeier BL, Lavoi NM, Power FC. The sport behavior of youth parents, and coaches: the good, the bad, and the ugly. J Res Character Educ. 2005;3(1):43-59. 4. Brooke de Lench. Home Team Advantage: The Critical Role of Mothers in Youth Sports (New York: HarperCollins 2006), pp. 120-121. 5. Gervis M, Dunn N. The Emotional Abuse of Elite Child Athletes By Their Coaches. Child Abuse Rev. 2004;13:215-223.